I had the extreme honor of serving as a judge at Tuesday’s Fire in the Triad event. This was a dream come true. Finally, all my hours of watching “Iron Chef,” “Top Chef” and “Chopped” had paid off. Jokes aside, I was thrilled to show off some of my culinary experience and expertise. Enjoying six courses, and thoughtfully giving my opinion on each dish was my idea of a perfect evening. As an image of Winnie the Pooh appeared on the TV screen, there was a collective “ah-ha!” among the diners in the room: the mystery ingredient was honey. Alongside my friend, colleague, and fellow judge John Batchelor, we prepared our palates for some incredibly unique dishes. Chef Leigh Hesling of Green Valley Grill was up against Chef Jon Willis of Emerywood Fine Foods. The chefs were introduced to “Down Under” by Men at Work (perfect for Aussie Hesling) and “Kiss” by Prince. I scanned the QC code at my seat and logged in, ready to judge based on presentation, aroma, flavor, accompaniments, creativity and execution. 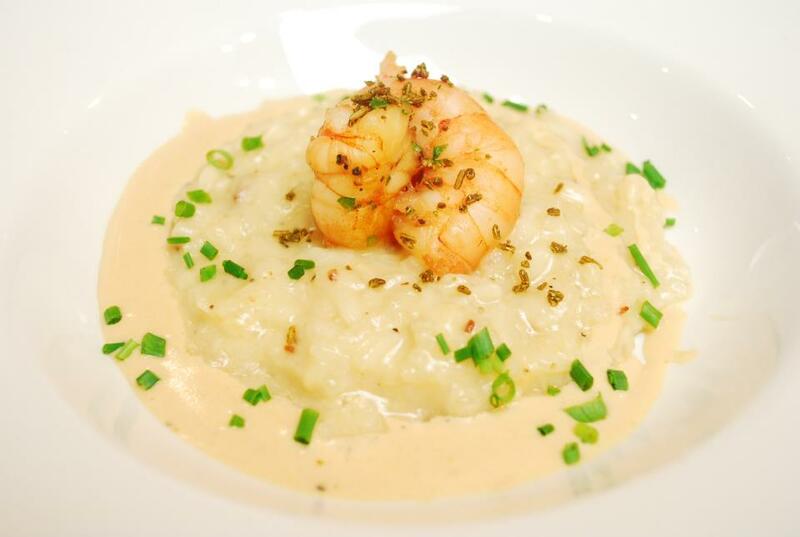 The first course was from Emerywood: Honey Glazed Roasted Shrimp, atop a bed of creamy Pancetta Risotto, surrounded by a silky Roasted Shrimp Bechamel, sprinkled with Fennel Dust. As I suspected, the fennel overwhelmed the shrimp, so it was difficult for me to detect the honey. The Pancetta Risotto and Shrimp Bechamel complemented each other perfectly. 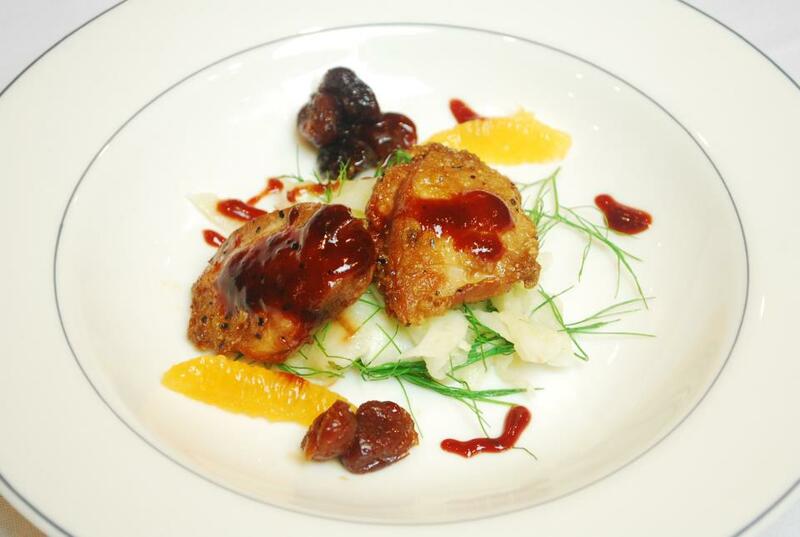 I preferred Green Valley Grill’s first course: Pan Seared Breast of Quail, resting on a Fennel-Orange Slaw, surrounded by Honey Poached Cherries, with a light Honey-Ginger-Lime Vinaigrette. I didn’t mind the fresh fennel in this dish; in fact, it married well with the orange wedges. 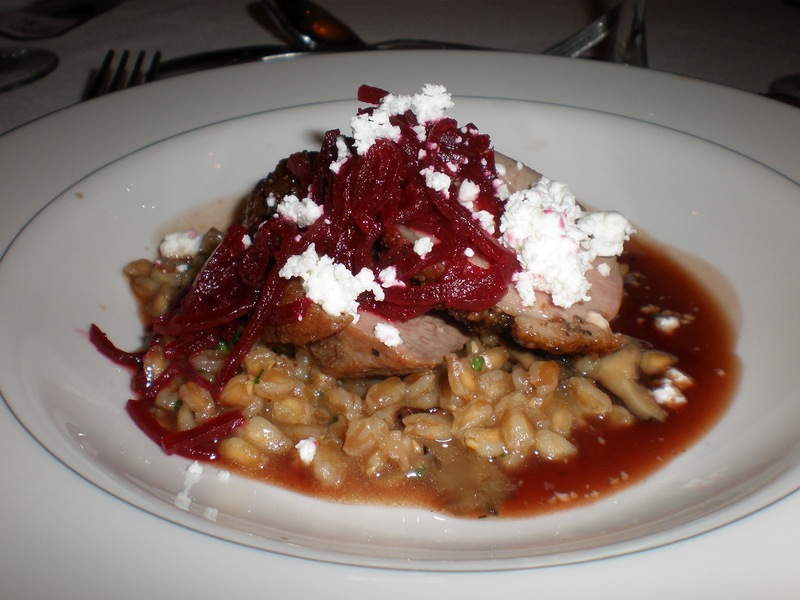 The cherries were saturated with honey, and the quail was cooked perfectly. This was a light and refreshing summer dish. The entrée round was extremely close. Both chefs brought their A game. 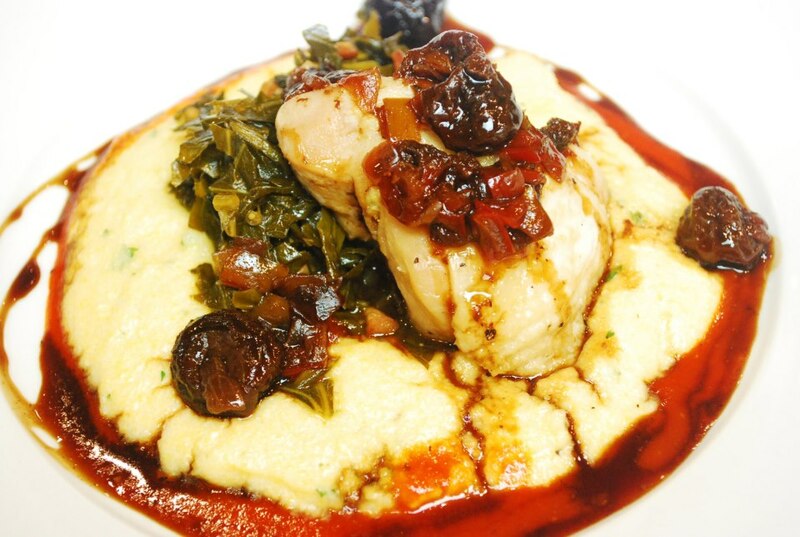 Emerywood hit a home run with Confit Breast of Chicken, Honey-Bacon Braised Collard Greens, Smoked White Cheddar Polenta, Honey Balsamic Gastrique, with a Bing Cherry Chutney. For a Southerner who doesn’t love collards (a sin, I know), I could have eaten an entire pot. The honey was very present, and was a delicious offset to the smokey, cheesy polenta. The dish looked like a piece of art and is Southern comfort food at its best. It should be added to their menu. An equally succulent entrée from Green Valley Grill presented a Honey Mocha Glazed Breast of Duck on a bed of Smoked Mushroom Farro, topped with Beet Cappelini, Crumbled Chevre, surrounded by a Honey-Blackberry Duck Jus. The Chevre was the perfect choice of cheese, and suggested a truffle flavor. Pairing honey and mocha was an unfamiliar flavor combination to me, but was executed exceptionally. This is a rich dish, perfect for a chilly fall evening, and I would pay big bucks to enjoy it again. Oddly enough, I enjoyed the savory honey dishes more than the dessert courses. 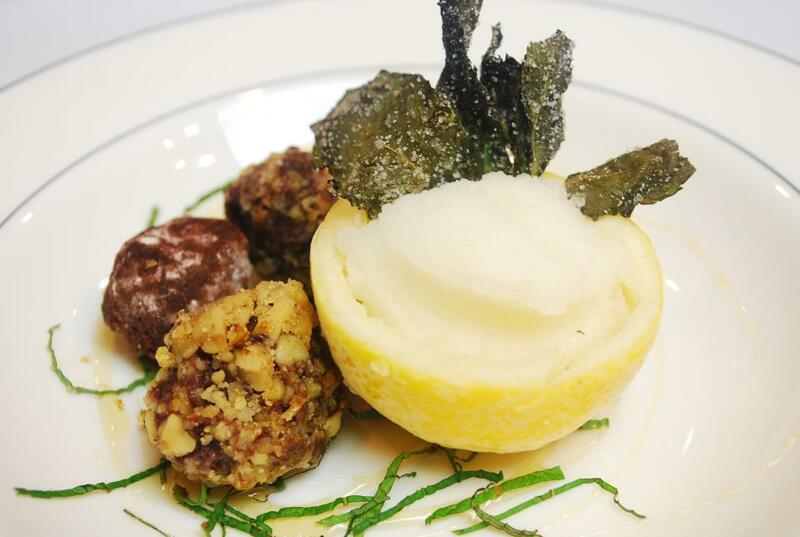 Chef Willis went for an “angels and demons” approach, with Lemon Basil Honey Sorbet Intermezzo with Crystallized Mint (angels) Blackberry Honey Couverture Chocolate Truffles (demons). Both were sinfully delicious. I was impressed with how noticeable the honey flavor came through in the chocolate, and appreciated the palate-cleansing freshness of the sorbet. 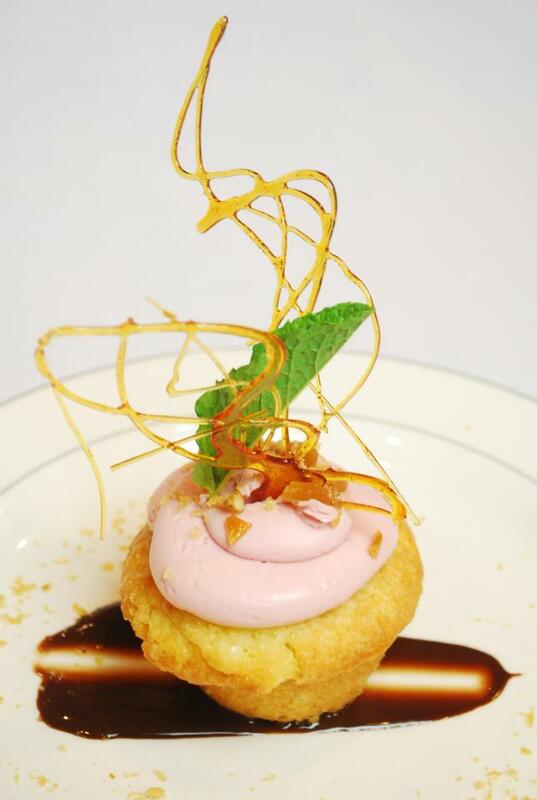 As Chef Hesling’s final dish left the kitchen, a dining companion remarked that the dessert looked “very Dr. Seuss.” A Honey Butter Cupcake was topped with Honey-Pomegranate Buttercream, filled with Vanilla Honey Mousse, sprinkled with Pine Nut Brittle, sitting on a swirl of Bittersweet Chocolate Sauce. The Dr. Seuss element was pine nut caramel “antennae” sticking out of the pink frosting – whimsical. I certainly detected the honey, but didn’t necessarily agree with the use of the chocolate – it seemed to weigh down the lightness of the dessert. Green Valley Grill took home the win, though the battle was extremely close. I had the pleasure of meeting and speaking with Chef Hesling after the competition. His charming personality, Australian accent and obvious passion for cooking make him a very likeable guy. I was elated to congratulate his team on their success. It was my pleasure to serve as a judge, and I would be thrilled to be asked to return.